Zoe has been participating in a day camp this week. It is run by a regular overnight camp, but they take the fun on the road and do day camps throughout the midwest. All the craziness without the homesickness. Zoe is in heaven. As I dropped her and her friends off this morning, I watched the counselors. Full of energy, singing camp songs, bouncy in their athletic sandals, wearing the proverbial whistle around the neck, these folks are chock full of love for kids and love for Jesus. My daughter believes they hung the moon. Just looking at their youthful exuberance makes me tired. I did. For three years. It was the experience of a lifetime with friendships made that are irreplaceable (ahem, ahem, Naomi please come home already!) And some of my favorite campers are my friends on Facebook and mamas themselves. Though watching the perky counselors this morning made me tired, it also made me grateful. Grateful that the world keeps spinning, and that I keep aging (birthday this week–yahoo!!) 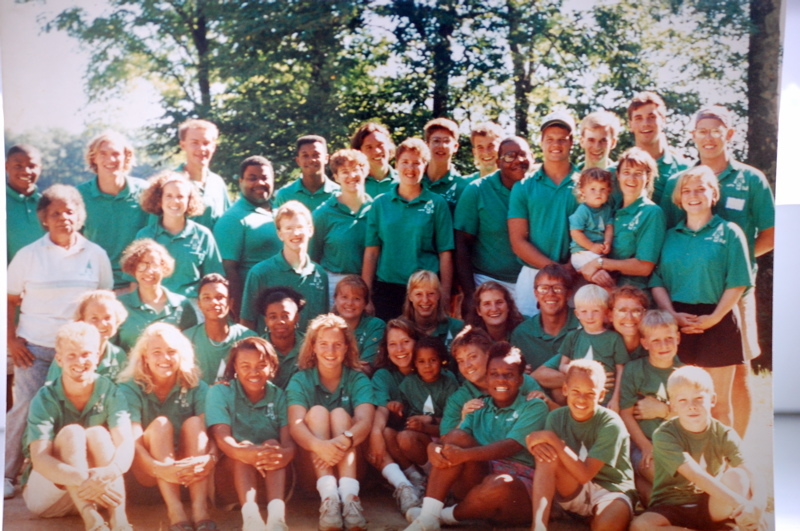 and that God brings up more youthful Naomis and Randys and CJs and Marks and Denises to make camp what it is for kids. It’s a wonderful thing. Thank goodness someone has the energy for it. PS. You are still perky. Proof positive: You singing camp songs to entertain three little girls 9 1/2 hours into a car ride (all of which you drove). Remember me falling out of my seat with laughter? Perky. All that’s missing is the whistle. ummm, hmmm, you still got those pretty legs, onaconnamyasthma. Happy Birthday Tashie!!! If that’s proof, you wouldn’t know it by me. WHERE are you on the picture??? Hi Aunt Betty! I’m the fourth from the left in the front row. I’m sporting a lovely perm. I love this picture. Wish Aquanet was in it too.